AUGUSTA, Ga. - Even without golf's biggest star, this suddenly is shaping up as a Masters for the ages. Jordan Spieth, playing a brand of big-time golf that belies his 20 years, kept his cool amid the chaos of Saturday at Augusta National. He was too busy trying to handle a lightning-fast golf course to even look at a leaderboard until he couldn't avoid them over the closing holes of a wild round. It's been 83 years since a player this young won a major, and 35 years since anyone won the Masters on his first try. "For a 20-year-old, he's pretty savvy. 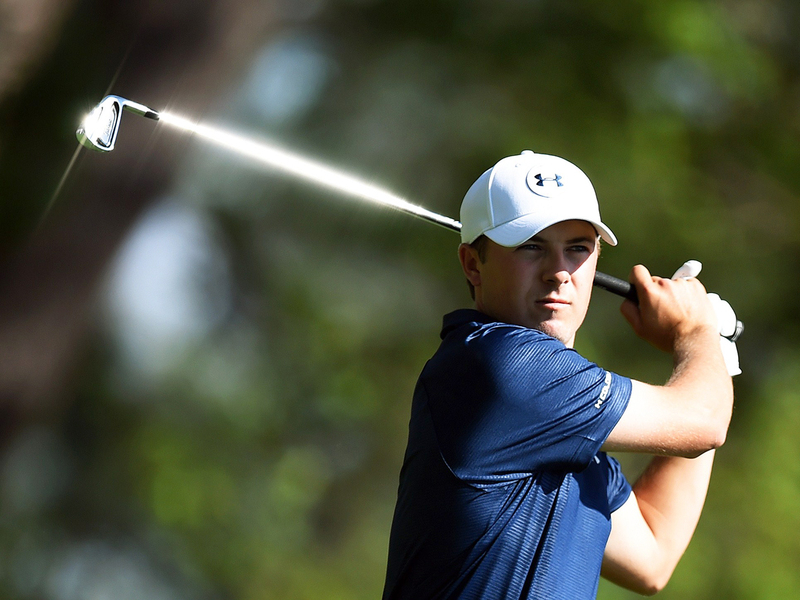 Not much bothers him," said Couples, who picked Spieth for the Presidents Cup. "Tomorrow obviously is going to be a really, really hard day to try to win this. But he's well qualified to do it." "Today was moving day," Spieth said. "And tomorrow is about seeing how I can control my game and emotions out on the golf course against guys that have even won here recently. So they have been in the position I haven't. Doesn't necessarily mean - I don't think - that they have an advantage in any way. I think that I'm very confident in the way things are going. And really looking forward to tomorrow." But there's a lot of traffic on the road to a green jacket, mostly because of Watson. He stretched his lead to five shots with a 7-iron to 6 feet for eagle on the second hold. He made only one birdie the rest of the way, a round sprinkled with putts that he either rammed too hard or left woefully short. Even so, the former Masters champion was right where he wanted to be. "If somebody told me I would have shot 2 over and still be tied for the lead, I would have taken it in a heartbeat," Watson said. "So I got a shot on Sunday." Matt Kuchar, who squandered chances to win in each of the last two weeks, hit a pitch from well behind the 15th green that had to be perfect and was, setting up the best of his six birdies in a round of 68. Kuchar, a favorite in these parts from his days at Georgia Tech, was one shot behind along with Masters rookie Jonas Blixt, who fell out of the lead with a bogey on the 17th and shot 71. "Bubba at this point is keeping me in it," U.S. Open champion Justin Rose said after his 69, leaving him only four shots behind. "There's a lot of players with a chance tomorrow. Anybody under par going into tomorrow has a good shot." That would not include defending champion Adam Scott, who might have thrown away his hopes with a 40 on the front nine that led to a 76. He was six shots behind. Spieth fell in love with Augusta National the first time he saw it during a golfing trip last October. He has leaned on two-time champion and fellow Texas Longhorn Ben Crenshaw in practice rounds, and he met with six-time champion Jack Nicklaus on Wednesday to learn as much as he could. The kid is a quick study. He didn't even have a PGA Tour card at this time last year. Since then, he won the John Deere Classic, became the youngest American to play in the Presidents Cup when Fred Couples made him a captain's pick, and had a chance in the final hour to win the FedEx Cup and its $10 million prize. Phil Mickelson might have seen this coming. He was paired with Spieth the last day of the Deutsche Bank Championship in September, when the kid shot 62. Mickelson called Couples and said, "Dude, you've got to pick this guy." Now, the young Texan has a good shot to join them in the champions' locker room.